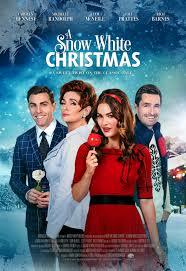 A Snow White Christmas is the latest ION holiday movie that will debut on December 9 at 9 PM. When Blanca Snow (Michelle Randolph) is faced with spending Christmas with her dastardly stepmother, Victoria (Carolyn Hennesy), she attempts to fulfill her late father’s wishes and create new memories as a family. However, Victoria plots to edge Blanca out of her father’s inheritance and keep the money and his mansion, for herself. She plans to renovate the house by hiring a talented designer, Lucas Prince (Colt Prattes), but when he falls in love with Blanca, Victoria is jealous and outraged. With the help of her assistant, Zane (Rich Barnes), Victoria has Blanca hypnotized, so she will forget everyone and everything about her father’s will. When Blanca wakes up in a quaint motor lodge out of town with severe amnesia, she receives the help of seven quirky friends, the Holly Jollies, to help her figure out her life. While attempting to regain her memory, she finds herself the object of affection to both house painter Hunter (Liam McNeill), and Lucas Prince. But, who can she trust? And will she finally remember her past, and stop Victoria from stealing everything her father built? Here is a trailer for A Snow White Christmas.